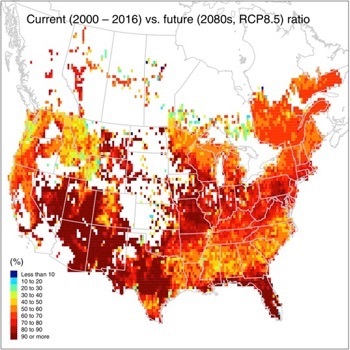 The top map shows the current distribution of forests across the United States and Canada; the middle map shows what the distribution is predicted to look like in the 2080s, with growth concentrated in the South, Northeast, and Pacific Northwest. 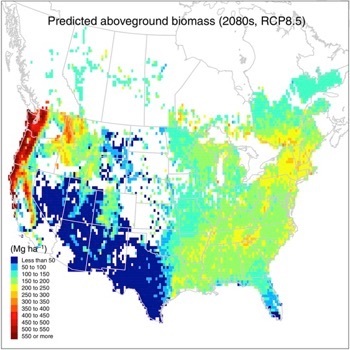 The third image depicts the growth capacity of forests to sequester additional carbon over the next 60 years, with red indicating limited gains even under the best-case scenarios built into the model developed by Kai Zhu. 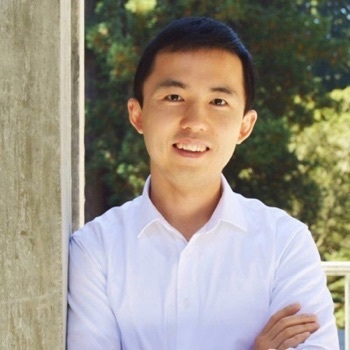 Zhu's team found that North American forests have reached 78 percent of their capacity to sequester carbon and will gain only 22 percent capacity—at most—over the next 60 years. That's a cautionary finding that has implications for forest managers, climate scientists, and policy makers. 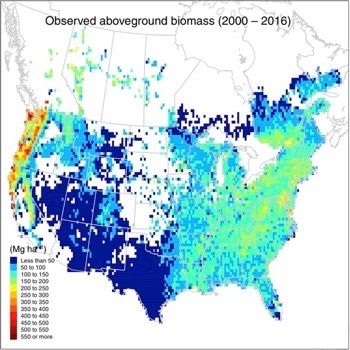 "To do a good job predicting the future, we have to consider both factors—natural recovery and climate change that modifies growth—because both are important biologically," he said.